Please find detailed information in the course brochure available here. The application period starts on 11 July 2018. Around the world, more than four billion people are living outside the protection of the law. They are unfairly driven from their land, denied essential services, excluded from society, and intimidated by violence. Legal empowerment seeks to turn this tide. It is about enabling people to understand, use, and shape the law. From at least the 1950s, when community paralegals in South Africa began helping people to navigate and resist apartheid, legal empowerment has grown into a global movement. Today, grassroots legal advocates in the Philippines are helping farmers to take part in nationwide agrarian reforms. In Argentina, shantytown residents are pursuing legal remedies to bring clean water and other essential services to their communities. World leaders increasingly agree that access to justice and legal empowerment are crucial to ensuring equitable and inclusive development, a recognition that led to the integration of justice in the UN Sustainable Development Goals. Every year the legal empowerment field becomes more robust, with greater evidence of what works. 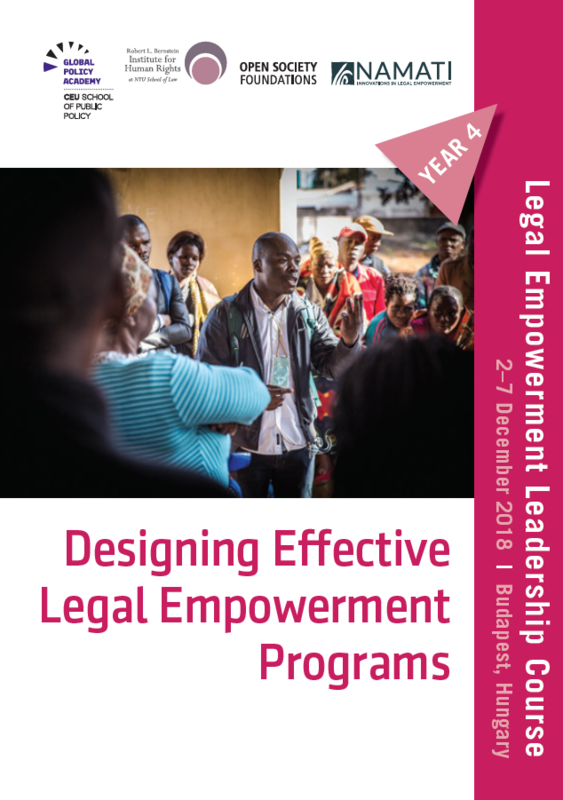 The 2018 Legal Empowerment Leadership Course is a unique opportunity to take stock of our collective knowledge and build upon it to strengthen a global movement for justice. The aim of the course is to cultivate a global cadre of leaders who are committed to legal empowerment, and who share a common understanding of the field, including history, methodology, and evidence. A faculty of respected practitioners and academics will lead course participants in an in-depth exploration of key themes, including the conceptual framework of legal empowerment, community organizing and social movements, and the role of grassroots legal advocates in realizing systemic change. The participatory course design will also emphasize peer-to-peer learning through small group work. The 4th edition of the annual course will focus on ‘Designing Effective Legal Empowerment Programs.’ The course is a collaboration between the CEU’s School of Public Policy, the Open Society Justice Initiative, Namati, and the Robert L. Bernstein Institute for Human Rights at New York University School of Law. Arrival and welcome reception will take place on Sunday, 2 December 2018. The course will finish on 7 December (noon). The full cost of participation in the course is EUR 2,000;– (incl. VAT). This does not include travel and accommodation (lunch and coffee breaks during the course will be provided). A limited number of scholarships covering travel, accommodation and the full cost of tuition will be available on a competitive basis. Note that scholarships will not be available for applicants from donor institutions. Interested individuals should complete the application form by 12 August 2018. For further information, please consult the course brochure available here.